The woman said to the serpent, 'We may eat fruit from the trees in the garden, but God did say, 'You must not eat fruit from the tree that is in the middle of the garden, and you must not touch it, or you will die. '" "The bright yellow patches, top right and left, were intended to suggest corners of a fresco or a tapestry, whose corners had rotted, revealing the golden wall beneath. To the right a sleeping child and three crouching women. Two people dressed in purple confide their thoughts to one another. An enormous crouching figure lifts up its arm and stares in astonishment at these two who dare to question their destiny. At the center someone is picking fruit. An idol, its hands mysteriously raised seems to indicate the Beyond. Lastly, an old woman nearing death appears to accept everything. She completes the story!" Interpreting excerpts of letters Gauguin wrote to a friend, Where Do We Come From? What Are We? Where Are We Going? can be understood as a meditation on birth, life and death in the light of Maori mythology. In Where do we come from? Gauguin poses all the existential questions that brought him to Tahiti in the first instance. He draws together a range of former paintings relating to the fable of Adam and Eve in order to address his ideal vision of Tahiti being an earthly Garden of Eden. 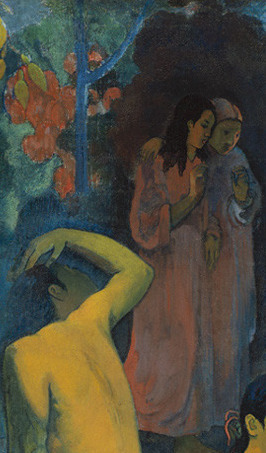 Each of the three major sections of this painting contains a different stage of Gauguin's evolving relationship with Eve, throughout his guiding force. Beginning at the left side of the painting and moving to the right, the painting first represents Eve in the form of an old woman, holding her head and crouching into her unclothed body. This image represents the Judeo-Christian school of thought and Gauguin's world before Tahiti. This Eve symbolizes his past and assumes the guilt and shame of humanity. Towards the centre of the What are we? section of the artwork there is a figure picking fruit in a fairly direct reference to the Tree of Knowledge of Good and Evil. 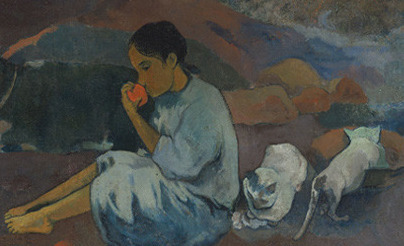 In addition to the connotation of Eve tasting the forbidden fruit, the ambiguity regarding the sexuality of the fruit picker represents Gauguin's attraction to the ancient concept of hermaphroditism - itself related to the Biblical story of how Eve was created from the rib of Adam. Gauguin highlights Eve's most important role as the original source of life and knowledge, which would not have existed but for the Fall. Her tall posture displays her acquiring knowledge and distributing it to those around her. Without the Fall, according to Gauguin, the world would have been void of questioning, as is represented by the existential work as a whole. Eve's height is also symbolic of humanity's high point, the development of the sense of self, and humanity's collective ability to stand up and take control of their own destiny. On the right of the painting is a baby, the expression of the new beginning which Eve represents for Gauguin. Although he finished the painting while suicidal and in poor health, Gauguin continued to reach towards Eve as a last grasp at inspiration, despite his multiple attempts at a new beginning in new environments ultimately failed him. Gauguin referred to Where Do We Come From? What Are We? Where Are We Going? as his "testament," because he planned to take his own life when the painting was finished. He worked feverishly, painting "on sackcloth full of knots and wrinkles," but found the finished work more than acceptable. Gauguin did not kill himself after completion of the work and it is entirely plausible he recognized the significance and breadth of his own piece. When Gauguin launched into Where do we come from?, his climactic work in 1897, he was in such wretched health, suffering the effects of syphilis and suppurating eczema that the locals believed he was a leper. In addition, his eyesight had begun to fail him, rendering him unable to paint for six months. Thus coming to the end of his artistic usefulness, Gauguin resolved to kill himself. However, before doing so, he was determined to focus all his efforts on creating one last masterpiece. Where do we come from? is this masterpiece and the summation of his ideas. Gauguin posed all of the existential questions that brought him to Tahiti in the first place and continued to plague him into his final days. "I am so demoralized, discouraged, that I don't think anything worse could happen." In 1891 Paul Gauguin left France for Tahiti, seeking in the Pacific a society that was untouched by the corrupting influences of Western civilization. In Tahiti, he created artworks (paintings and sculptures) that express a highly personal mythology. However, if Gauguin's correspondence from the time is to be believed, his second departure for Tahiti in 1895 was undertaken in a different frame of mind to his first. It was not just a final farewell to the European way of life, but also his artistic career. He also sought peace of mind in exile away from having to "battle endlessly against idiots. " However, upon arriving in Tahiti he did not find the solace that he was looking for, his poor health forced him back to hospital and his savings ran out. In April 1897 he learnt of the death of his daughter Aline, to whom he was deeply attached. This period of despair corresponded with a prodigious creative output, for during this time he painted, sculpted and wrote a great deal. Where do we come from? can thus be seen as his artistic last will and testament. Over 3.75 meters in length, Where Do We Come From? What Are We? Where Are We Going? was the most ambitious painting of Gauguin's career. It presents a summation of his Polynesian imagery, filled with Tahitians of all ages situated at ease within a terrestrial paradise devoid of any sign of European civilization. 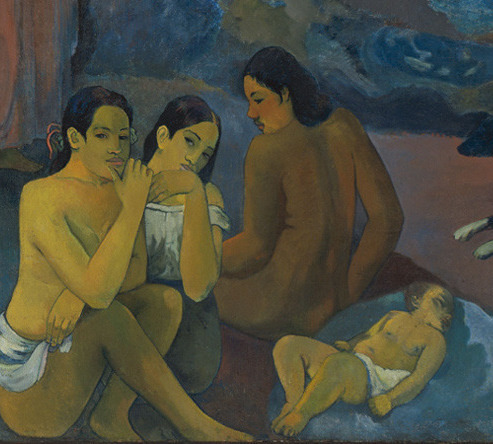 Gauguin indicated that the painting should be read from right to left, with the three major groups portraying the questions posed by the title. The three women and baby represent the beginning of life, the middle group symbolizes the normal, everyday existence of adulthood, and in the final scene an old woman approaching death appears reconciled and resigned to her thoughts. Gauguin stated that the "strange white bird represents the futility of words". The blue idol in the background represents the Beyond. The many forms and deep spaces of this hugely complicated composition are tied together by its overall tonalities in green and blue. It was the element of color that Gauguin called a 'language of the dream'. His impressive use of brush stroke and color allow him to create a painting that evokes various feelings about the different stages of life. Furthermore, he uses color in order to emphasize various parts of the painting in order to draw the attention of the viewer and accentuate the emotions he wishes to convey. The repetitive use of a dark blue within the background and with regards to the idol and shadows creates an atmosphere of despair and sadness. The background is a forest, which would normally have been painted with green and brown tones, but is tinted with dark blue, evoking a feeling of the unknown and of the surroundings closing in on the three groups in the foreground. The color blue also matches the idol which represents the Beyond, thus associating the surrounding with the Beyond as well. We see that the only area in which there is significant light is on the pair of young women in the centre, who are able to experience youth and adulthood. Upon viewing Gauguin's Where Do We Come From? What Are We? Where Are We Going? one can sense how the use of color and shadow evokes a feeling of despair. Coupled with the Gauguin's choices in subject matter, the painting creates a description for the entirety of life. As displayed by the parts of the painting enveloped by blue shadow, life is shrouded almost entirely by the Beyond except for the portion of youth and adulthood in which you can temporarily free yourself from sadness and fear. 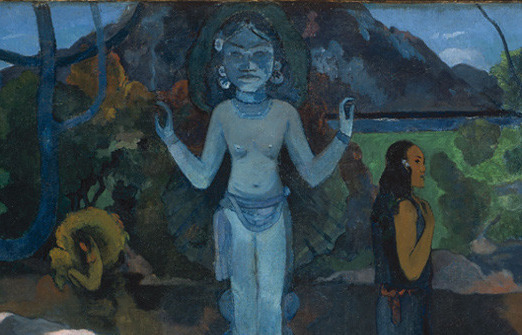 Combined with his use of color, Gauguin uses emphasis in brush stroke through various parts of the painting in order to draw the attention of the viewer. Where do we come from? What are we? Where are we going? is not only the most colossal canvas that Gauguin painted in his entire life, but also the work that expound the entire philosophical and pictorial doctrine of the artist. "Too few people realize that this painting is a national treasure, representing as much of a pre-modernist breakthrough as Manet's Déjeuner sur l'Herbe, Seurat's Grande Jatte, or Picasso's Les Demoiselles d'Avignon." Gauguin's masterpiece Where do we come from? was not critically received during his lifetime. This was due in part to both the proximity to his death after completion, and the distance separating the artistic circles of Paris from Tahiti. However, if one is to judge by the lackluster reaction his Tahitian work received upon his first return to France in 1895, there is no evidence suggesting this work would have met with the approval it thoroughly deserved. 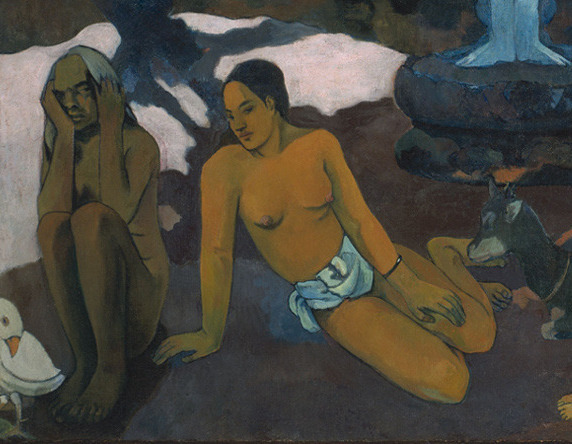 It was only after his death that Gauguin's total body of work, including Where do we come from? was met with widespread critical approval. Indeed, a craze for purchasing Gauguin's paintings came in posthumous exhibitions in the Salon D Automne in Paris in 1903 and 1906. Where do we come from? 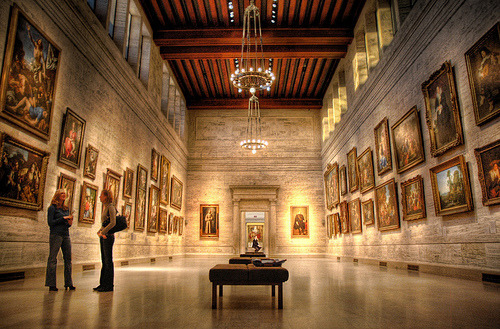 was purchased by the Museum of Fine Arts in 1935 and has since been renown as one of its most spectacular creations. In 1898 Where do we come from? 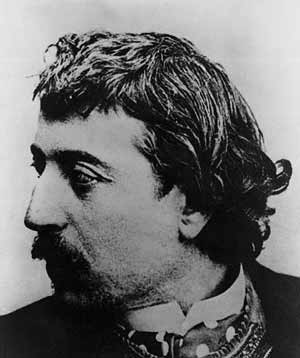 was sent by Gauguin in Tahiti to Daniel de Monfreid in Paris. It was then consigned to Gauguin's agent Ambroise Vollard, where it was exhibited in his gallery, the Galerie Ambroise Vollard, between November 17 and December 10, 1898. Vollard in turn sold the work to Gabriel Frizeau of Bordeaux in 1901. As best we know, it was sold by Frizeau in 1913 to Galerie Barbazanges, Paris. It was exhibited there during 1914, and in 1920 was sold on again to J. B. Stang (Oslo). In 1935 it was probably sold on to Alfred Gold. In 1935 Gold lent the painting to the exhibition "L'impressionisme," Palais de Beaux-Arts, Brussels, where it was displayed between June 15 and September 29. Gold had purchased other works from the Stang collection, and almost certainly acquired this painting directly from him. Marie Harriman acquired the painting in Paris in 1936, before it was sold by the Harriman Gallery (New York) to the Museum of Fine Arts later that year for $80,000. Official accession date - April 16, 1936. Gauguin's Where Do We Come From? What Are We? Where Are We Going? was painted during his second visit to Tahiti in 1897. It was the artwork that he had always wanted to create - a broad ranging philosophical piece that exemplified the ideals of the 'savage' as untouched by the corrupting influence of European 'development'. As per most of his existence in Tahiti, Gauguin's time was marked in abject poverty and being constantly hounded by the local officials (given his supposed moral depravity and subversion of the natives). For this reason he possessed a 'me against the world' type attitude that is seen in his art. Where do we come from? is an accentuation of Gauguin's Post-Impressionistic style. It is part of a body of work that stressed the vivid use of colors and thick brush strokes, while it aspired to convey an emotional or expressionistic strength. Gauguin's style emerged in conjunction with other Avant-garde movements of the 20th-century, including Cubism and Fauvism. The foundations of modern art beginning at the end of the 19th-century involved not only a search for new forms and new realities, but also a search for new content and new principles of synthesis. 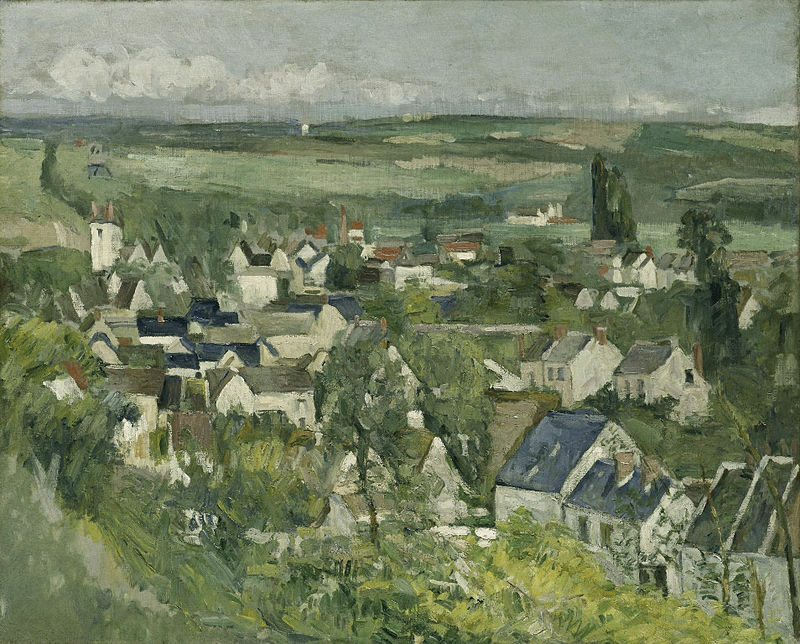 This became a conscious program in Gauguin's paintings, first of all in the artist's colony of Pont-Aven in Brittany and then later in the Pacific. It was in Tahiti where the mystery of a beautiful people living in an earthly paradise haunted by the gods and spirits of their religion that Gauguin's interest was satiated. The subjects he pursued were those of the Romantic tradition - the exotic, the otherworldly, and the mystical. In this, Gauguin was affected by the Symbolist spirit. Gauguin's Where do we come from? in effect represents the culmination of his primitive art. There would be no more masterpieces, primarily because Gauguin's body was so ravaged by syphilis that he would still die a relatively short time after its completion. Also, given that Gauguin was in Tahiti (as the sole European artist), he had no protégé with whom he could leave his theories about art or be similarly inspired by the Tahitian landscape. Despite this, the artwork itself is so comprehensive it remains a legacy of the primitive art period.